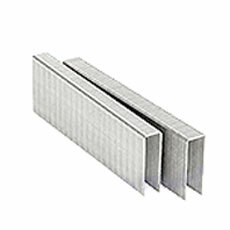 PRODUCT: N-11 Series Staples (Senco type). 3/4" Leg x 7/16" Crown, 16 Gauge, ELECTRO-GALVANIZED, Chisel Point. 10,000/Box. Price/Box. OUR QUALITY IS GUARANTEED ! APPLICATIONS: Roofing, Sheathing, Siding, Planter Boxes, etc. Senco SNS200XP 7/16 Medium Crown Stapler. Uses 1 - 2 inch length 16 or 17 Gauge (N or O Wire Series) Staples. Heavy Duty Production Stapler. Contact Fired. New with 5-Year Factory Warranty. Price/Each. REPLACED WITH NS20XP.